IGF-1 (Insulin-like Growth Factor-1), also known as Somatomedin C is a 70 amino acid protein that is produced mainly in the liver. 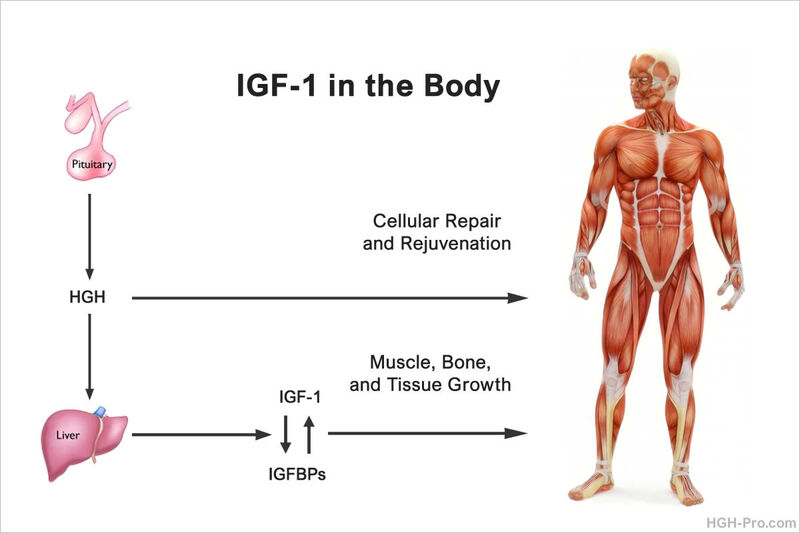 IGF-1 is only one of the body's many growth factors. It is a part of the insulin super-family. Growth factors function similarly to hormones, however hormones usually send long distance messages and the growth factors usually send local messages. They regulate cell growth and control the metabolic processes. They enable the cells in the hormonal, immune, and nervous systems to communicate and coordinate their growth, death, regeneration, and functioning. Cell reproduction slows down as we age. Unless they are prompted by the growth factors they will go into a resting phase. IGF-1 is responsible for a wide range of cellular functions and is required for normal growth and health maintenance. These functions include cellular differentiation, transformation, and apoptosis suppression. IGF-1 helps to transfer glucose through the cell membranes and helps to supply the raw materials that cells need for growth and repair. It also regulates cell growth by moving the cells from the resting phase to the active phase of its cycle and it increases the cells ability to complete DNA synthesis. Clinical evidence shows that low IGF-1 levels play a key role in the degenerative changes brought about by the aging process. About 70% is produced by the liver in response to human growth hormone, which is produced in the pituitary gland. In fact, the majority of benefits related to HGH are actually brought about as a result of IGF-1 and other growth factors such as IGF-2. Eric Dupont, Ph.D., says that HGH is the general and IGF-1 and other growth factors are the foot soldiers that work at the cellular level. By taking IGF-1 directly the pituitary gland and liver are bypassed, which is good if they are damaged or worn out due to aging. Dr. Keith Kelly, Ph.D., who has done much research on anti-aging believes that the real future of anti-aging medicine lies with IGF-1. The DNA of cells is constantly being attacked by free-radicals and other environmental factors. It is able to heal itself but this ability decreases with age. Antioxidants have been the only way to help combat this process up until human growth hormone and IGF-1 came on the scene. Research shows that HGH and IGF-1 can do much more than antioxidants. They can bring the cells the raw materials that are needed for repair. HGH can help to bring amino acids into the cytoplasm of the cell while IGF-1 can deliver nucleic acids into the nucleus of the cell. IGF-1 is being found to have numerous potential, including healing and rejuvenating the nervous system. Other research is showing improvements with damaged nerve tissue, brain injury, seizure, stroke, neurodegenerative diseases such as Alzheimer's Disease, Muscular Dystrophy, Multiple Sclerosis, Parkinson's Disease, spinal cord injury, and neuropathies. Researchers believe that IGF-1 can also stop programmed cell death, and if so it can drastically reduce the damage that occurs after a CVA (stroke) and myocardial infarction (heart attack). For the first time IGF-1 may give us a weapon against death at the cellular level! Nelly Mauras and Bernard Beaufrere, at the Children's Clinic, Jacksonville, Florida, showed that IGF-1 improves glucose metabolism. John Wittig, MD of UCLA has been using IGF-1 to prevent AIDS wasting in HIV infected patients. IGF-1 may allow more aggressive chemotherapy of certain cancers, since drugs like Vincristine and Cisplatin can cause peripheral neuropathies at higher doses. Phil Micans, of International Aging Systems has predicted that IGF-1 will be the hormone of choice in a few years. Clinical research has shown that IGF-1 may be used to repair peripheral nerve tissue that has been damaged. If a nerve is torn in the arm or leg it means that the connection to the muscle may be impaired, and as a result there is loss of movement and the muscle atrophies. While peripheral nerves can regenerate to some extent severe tears of more than a few millimeters may result in permanent injury. IGF-1 has repaired and reconnected severed nerve endings of up to a distance of 6 millimeters, a feat previously unheard of. Swedish scientist Hans-Arne Hansson of the Institute of Neurobiology at the University of Goteborg found that IGF-1 and other growth factors could stimulate even more dramatic regeneration. "IGF-1 by itself and in combination with other growth factors is likely to be of importance in promoting healing and repair processes in clinical practice," he writes. In studies of cells in culture and in animals IGF-1 has been shown to have remarkable effects on the spinal cord motor neurons. It increased motor neuron activity in spinal cord cultures by 150 to 270 percent. In animal studies IGF-1 significantly decreased apoptosis (programmed cell death) and enhanced the sprouting of axons of the spinal cord motor neurons. It increased intramuscular nerve sprouting a whopping ten fold when it was given to normal adult rats. In fact, according to a group of researchers at Cephalon, Inc., in West Chester, Pennsylvania, IGF-1 may be the long-sought endogenous motor neuron sprouting factor. The possibilities seem endless at this time. If IGF-1 can regenerate spinal cord motor neurons it may be useful in treating amyotrophic lateral sclerosis (ALS), a disease that causes the loss of spinal cord and cortical motor neurons and results in complete paralysis and death. It may also be useful for other peripheral neuropathies. This is IGF-1 that has gone through the homeopathic process. Like the injectable form homeopathic IGF-1 works in many different areas of the body to facilitate and improve cellular health and performance. It is believed to bring aging, resting cells back into a balanced state. A recent independent double-blind, placebo-controlled clinical study demonstrated effectiveness in the nervous, reproductive, musculoskeletal, and gastrointestinal systems. In the study, homeopathic IGF-1 improved energy levels and physical performance, improved respiratory conditions, and even relieved symptoms of PMS and menopause. Homeopathic IGF-1 also relieved muscle and bone aches and pains, as well as joint stiffness and inflammation in the body. Lastly, it improved mental concentration and clarity and positively affected the appetite of the test subjects. 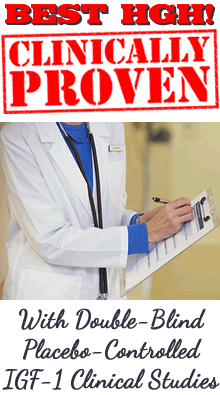 Increases in lean body mass have been reported. Homeopathic IGF-1 balances weight by helping the body to achieve its ideal muscle/fat ratio, whether that means losing fat for people too heavy, or gaining muscle for people too lean. Since HGH and IGF-1 work so closely together in the body they make a great team when used together in a homeopathic system. Human growth hormone seems to be a "night hormone" and IGF-1 a "day hormone" (one reason why both are needed), so the two could work synergistically and catalytically in the body. Feeling Younger With Homeopathic HGH Dr. Howard Davis. The Body's Wonderful Growth Factors!